Kevin Pillar posted a lengthy thank you message to his Toronto fans on Instagram Monday night, hours before hitting a grand slam for his first home run with his new team. Pillar, the longtime Blue Jays centre-fielder who was traded to the San Francisco Giants last week, called Toronto fans "the most incredible, honest, passionate fans from coast to coast," in a caption that accompanied a photo of him in a Jays uniform. "You will always have a special place in my heart and for that, I can't thank you enough," he wrote at the bottom of the message. Pillar played 695 regular-season games for Toronto from 2013 to 2019. He was the longest tenured Blue Jay at the time of the trade. The 30-year-old began his Instagram post by describing the week since the trade as "some of the most difficult and challenging days of my career," and said he needed time to process his feelings after getting himself and his family settled in San Francisco. "Thank you isn't enough Toronto. I gave you my heart and you gave me yours back," Pillar wrote. "I was just a California kid who always had a dream of playing in the big leagues. Never in my wildest dreams would I be playing 3,000 miles away from home in a different country. On August 14, 2013 I made my MLB debut in Toronto but what I didn't know is you would be my home for the next 7 years of my life." Pillar singled out former Jays general manager Alex Anthopoulos and former team president Paul Beeston, who presided over Pillar's draft year in 2011, when he was selected by Toronto in the 32nd round, and scout Kevin Fox, who helped convince the Jays to pick him. He also added a thank you to trainers, stadium employees, clubhouse staff and his Toronto teammates. "Thank you for the most unbelievable ride. We had some challenging years but we also had some pretty magical and incredible years. Despite the ups and downs of a season, you guys were the ones who made me want to play as hard as I could every single day, regardless of the score." 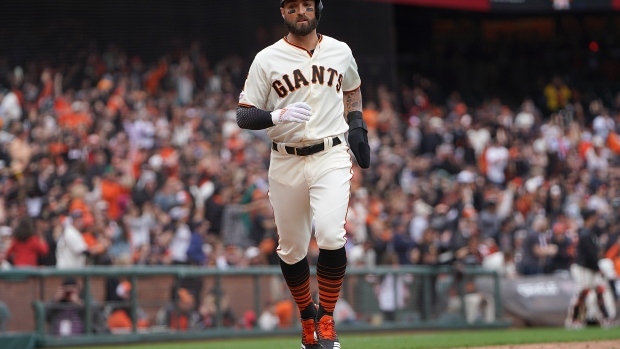 Pillar hit a grand slam off San Diego Padres pitcher Eric Laurer in the fifth inning of Monday's game in San Francisco, giving the Giants a short-lived 5-0 lead. It was his third hit in six games as a Giant. The Padres won the game 6-5. Pillar, who became a fan favourite in Toronto thanks to his impressive defence, was named a Gold Glove finalist three times in his career. He batted .252/.282/.426 with 15 home runs and 59 runs batted in for the Blue Jays in 2018 and was 1-for-16 with three strikeouts in 17 plate appearances before the trade. Toronto received infielder Alen Hanson and right-handed pitchers Juan De Paula and Derek Law in the deal.